"Tell him to get me my money!!" RLJ Entertainment has debuted a trailer via the Today show for a film called Nina, starring Zoe Saldana as the very rambunctious Nina Simone, who was a singer, songwriter, pianist, and civil rights activist. While there was a documentary made about Nina recently nominated for an Oscar this year, called What Happened, Miss Simone?, but this film is a much more powerful drama and features the relationship between Nina and Clifton Henderson, played by David Oyelowo. Both Saldana and Oyelowo look kind of amazing in this, no seriously, they looks incredible. Kind of interesting to follow up the Oscar ceremony - like, look, here is a great black performance!! Or two! The full cast includes Mike Epps, Ronald Guttman, Ella Joyce and Ella Thomas. I'm looking forward to seeing this. Take a look below. 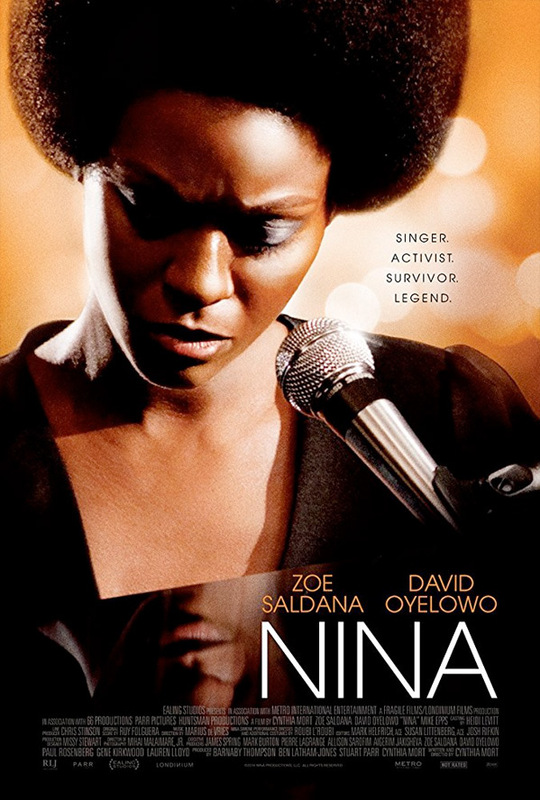 She was one of the century’s most extraordinary talents, a 15-time Grammy nominee and Grammy Hall of Fame Recipient; her mesmerizing songs and passionate politics combined to make her the unforgettable Nina Simone (Zoe Saldana). But fame and fortune came with a price, and her later years were riddled with depression, alcohol abuse and isolation. Rediscovering the meaning of her life and work took courage, strength and one true friend: Clifton Henderson (David Oyelowo), the man who started out as her assistant and eventually became her loyal manager. With Clifton’s encouragement, the “high priestess of soul” began a courageous journey back to her music… and, eventually, herself. Nina is both written and directed by filmmaker Cynthia Mort, a producer and the creator of "Tell Me You Love Me" making her directorial debut. The film will open in select theaters + on VOD starting April 22nd this spring. Thoughts? Here's the thing Alex. As good as Oyelowo and maybe even Zoe is in this film....Zoe has already expressed disdain for the film. I'm not going to knock her performance in a film I haven't watched yet. .. but the main concern was the casting choice...and the fact that Saldana had to have her skinned darkened to play the role. Fans wondered why someone akin to Viola Davis....or 'Pariah' lead Adeporo Oduye...or singer India Arie....couldn't have been cast. Part of the power and allure of Simone was the fact that she wasn't considered a classic beauty...the same claim that was slapped on Viola.....so many fans felt like casting a lighter skinned actress to then darken her up is already muddling the possible intent of the film. They being said....I appreciate your excitement for the film...I always appreciate your diverse coverage of films of all shades....and I sincerely hope that Zoe's talent can shine thru in this film despite the hesitancy of some film fans (particularly fans of Nina like myself). I'll be happy to see the movie no matter what, but I get what your saying about getting an actress that actually looks like Nina, to me she's one of the most beautiful human beings that ever walked the earth and her music will live in my home/heart/head forever. The film does look a little low budget in production, but I'm hoping it comes out ok. I'm boycotting the film for the very reason you said. Saldana is not that great an actress and there are other darker skinned women who would have channelled Nina Simone better. I'm 50-50 on her performances being too over-the-top. But I have followed her since The Losers, and I'm a bit sad a high-profile dramatic lead for her is turning into a public relations mess. Thanks for this comment. It needed to be said. That player isn't working for me, it's on Youtube now though. Wow, some how, for all this time, I thought her name was Salandra. I need to get some glasses me thinks. Like its not even close. Uh-oh. Message to the Academy: you don't have to nominate this one. Uh-uh. Nope. Wu-oh... at least Oyelowo looks decent. This looks like it'd make a great double feature with that Ethan Hawke Chet Baker movie of films I'll never see. None as "popular" or "bankable". Look at her resume. Guardians, Star Trek, Avatar... she's the Ms. Sam Jackson of blockbuster franchises. Well that's one way to to avoid the "white guys black girl" stereotype she's been placed in for so many years. My pick for Nina would have been Danai Gurira (Michonne from The Walking Dead). I like her as Michonne. What's a white guys black girl?? ROTFL... "she drinks, smokes, is outta shape.." cut to showing Zoe's skinny arms. I don't agree with casting a "light-skinned" black woman as such a controversy. After all, it shows how racist (even sub-race racist, for lack of a better word) these "anti-hate" groups are. If the film makers insisted on darkening her skin tone, then they should've put her in a fat suit at the least. Or... gasp!... have her gain weight. If you're not going to go all the way with makeup (Eddie Murphy, Robin Williams, etc) or "method acting" (Robert Deniro, Christian Bale, etc) then they should've left Zoe looking like Zoe. There will always be controversy in casting such a beautiful person in an (I'm sorry to type this) "not-attractive person's" role. Did any of these people (racially charged pun intended) see Monster, with Charlize Theron? Or the awards she got? Should've been the obvious route to take.